Carr House in Cayton, Scarborough, NYorks sleeps 9 people. Set on a farm in a peaceful location, with far reaching views, this large single-storey detached property offers comfortable holiday accommodation, with antique and reproduction furniture adding to its character and charm. Visitors of all ages will love to relax in the spacious spa hot tub situated on the patio, heated all year round to a perfect 39 degrees. It features a myriad of whirlpool and bubble jets, plus soothing underwater lighting perfect for night-time dips. Visitors can enjoy the very large landscaped gardens with summerhouse, apple trees, secret doorway in wall leading to a ½ -acre paddock with picnic table, dog walking area and views over pony paddock. The white sandy beach at Cayton Bay is just 1½ miles away and Scarborough is only 4 miles. One of the oldest seaside resorts, and still one of the most popular, Scarborough boasts two beautiful beaches, a wide choice of restaurants and its own theatre, where plays by the famous Alan Ayckbourn can be enjoyed. Featured in the TV series The Royal, a stroll along the Esplanade is a delight, and the many places to visit include the ruins of the 12th-century castle with its breathtaking views, Peasholm Park, The Sea Life centre and an open air swimming-pool. Further inland are the North Yorkshire Moors, renowned as an area of outstanding beauty with many quaint villages. Historic Whitby (25 miles) is where Captain Cook is known to have learned his trade, and the town is also home to an ancient abbey and a colourful harbour and marina – boat trips from here provide excellent sea fishing. Spring demands a visit to the daffodil fields at Farndale – a truly magnificent sight to behold. The North Yorkshire Moors Steam Railway, picturesque Robin Hood’s Bay and Flamingo Land theme park are all within easy reach. York 40 miles. Helmsley 40 miles. Entrance hall with patio doors to conservatory and decked patio. Large living room with open views of surrounding fields. Large dining-room with patio doors to decked patio. Spacious, well-equipped farmhouse-style kitchen with breakfast area. Large utility. Large sitting room with open fire, piano and views of garden. Two double bedrooms. Twin-bedded room with 2ft 6in beds. Bunk-bedded room. Bathroom/W.C. with over-bath shower. Shower room/W.C. For a better idea of where Carr House is, you can see Carr House on the map below. Carr House is in North Yorkshire; should you be on the lookout for a special offer, you can find all the special offers in North Yorkshire. It's always worth checking to see what is on offer at the moment. 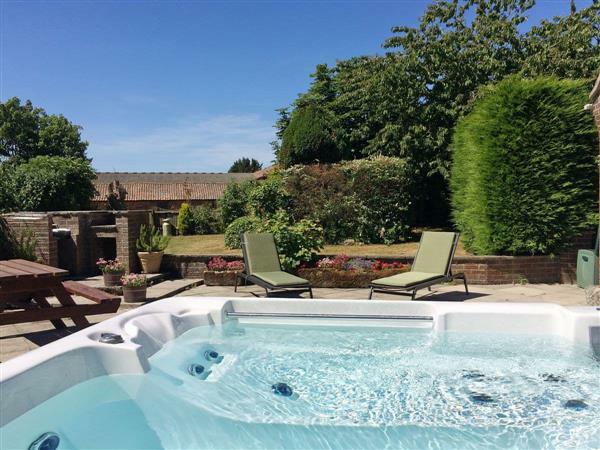 Do you want to holiday near Carr House (IJZ), you can see other cottages within 25 miles of Carr House; have a look to find your perfect holiday location.